Prefabricated steel buildings have become increasingly popular over the last few years – they’re an inexpensive and easy way to create extra workspace, a structure such as a security building, or a temporary office at a construction site. However, if you’ve gone this route, you know there can be one significant issue with them – they can get scorching hot inside. Even on a relatively cool spring day, without adequate ventilation, temperatures can reach over a hundred degrees in a steel building. So, needless to say, using steel for office space has the potential to leave your workers pretty darned uncomfortable and unhappy when the weather gets warm. And even when a steel building is just used for storage, workers risk suffering from excessive heat whenever items inside need to be moved or rearranged during warmer months. But you can beat the heat that’s generated inside steel buildings by installing a commercial screen door in addition to your regular exterior door. Using a screen door for steel buildings provides a large opening to create a huge volume of airflow. And, importantly, it does so without leaving your facility open to bugs or allowing unwanted people easy access. You can even install a security locking handle or a screen door deadlock to provide an extra layer of protection. Moreover, if you’re looking for energy saving ideas for your steel building, a commercial screen door is a great place to start. With the increased airflow capacity that a screen door allows, you’ll be able to restrict air-conditioner use to only the hottest days, saving yourself money and at the same time helping to save the planet. You might be wondering about installation – how big a pain in the neck will this be? When you purchase a PCA screen door, no special hardware is required for installation in your steel building. Everything you need comes included with your door, making installation completely hassle free. And all of our doors can even be left handed or right handed, or to swing in or swing out. 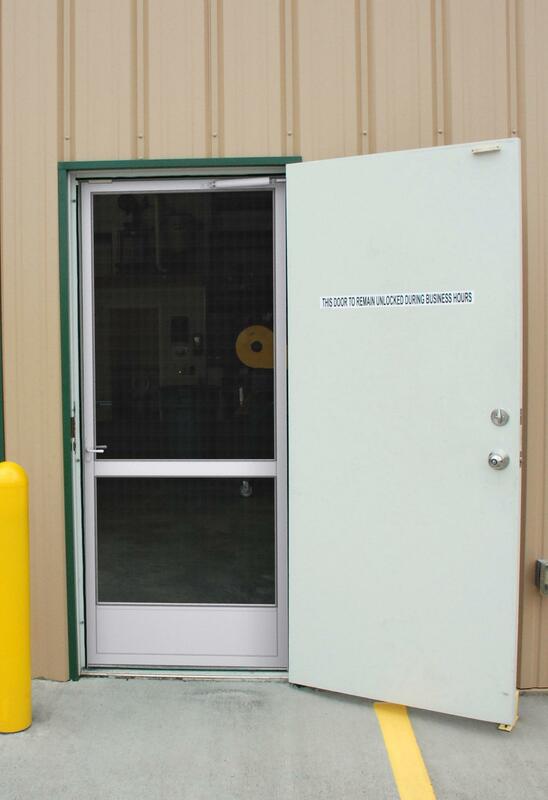 Clearly, when you have a commercial building, wear and tear is a consideration; you need to have a du rable door. Some screen doors are more durable than others. PCA screen doors feature a heavy aluminum frame that holds up to heavy traffic. They’re powdercoated rather than painted for an extra layer of durability, come with a full length piano hinge for a stronger attachment to the doorframe, and have rust free hardware and a self-locking screen that won’t blow out on blustery days. So whether you’re looking for commercial energy saving ideas, or just ways to make your employees more comfortable and secure, installing a screen door in your steel building is a great way to let the fresh air in without leaving it wide open to unwanted intruders, whether they happen to be of the insect or the human kind.